It is so important to be mindful of ingredients in the cosmetic products that we use because they ultimately end up inside of our bodies. If these products contain toxic ingredients, they can potentially cause health problems, disrupt our hormones and can be carcinogenic, among other issues. According to the David Suzuki Foundation, many chemical ingredients in cosmetics have NEVER been tested for their effects on human health and the environment. * If we are not careful our bodies can become bombarded with harmful cosmetic ingredients that can enter our bodies through inadvertently breathing in sprays and powders, swallowing products that we put on our lips or hands, and by absorbing them through our skin. Sometimes it is difficult to decipher the long lists of ingredients and the prospect of looking up every second word listed can be overwhelming. The good news is that there are many products available with simple ingredient lists that do not require a dictionary to understand. My motto is always "the fewer ingredients the better!" Be wary of "Green Washing" marketing tactics, where brands label their products as "natural", "clean" and sometimes even "organic", but they still contain nasty ingredients that you definitely do not want on, in or around your precious body. Reading the ingredients listed on products is key. The Environmental Working Group's Skin Deep Cosmetic Database is a helpful resource for deciphering ingredients. You can learn more about ingredients to avoid and search the EWG ratings for over 60,000 products here. It is common for cosmetics to include ingredients derived from non-human animals (like glycerine) and their secretions (dairy and eggs). Look for products that are labeled "vegan" and "ethically sourced" to avoid contributing to animal agricultural practices. Vegan products are also cruelty-free and will not include ingredients or derivatives that are tested on animals. I highly reccomend checking out Cowspiracy: The Sustainability Secret, a groundbreaking feature-length environmental documentary following intrepid filmmaker Kip Andersen as he uncovers the most destructive industry facing the planet today – animal agriculture - and investigates why the world’s leading environmental organizations are too afraid to talk about it. A new cut from executive producer Leonardo DiCaprio is now streaming exclusively on Netflix. Also, check out The Best Speech You Will Ever Hear by Gary Yourofsky on YouTube here. An excellent way to avoid cosmetic products that contain pesticides and related chemicals, as well as genetically modified ingredients (GMOs), is to choose organic products. In general, organic products are sustainably produced with care for our environment. GMO ingredients are of particular concern as the technology is so new, which means that long-term testing is virtually non-existent. Although nature cross-pollinates seeds, genetic modification allows for the incorporation of genes from entirely different species, which is novel and a threat to biodiversity. *** The controversy surrounding GM crops is incredibly politicized by huge corporations with deep pockets and news surrounding farmer suicides. The labeling of GMOs is not mandatory both in Canada and the United States, so unless the ingredient or product is Certified Organic, or if you can ask the farmer directly, you can never be quite sure. I've got you covered from head to toe with bath, beauty and body products that I love and trust. These products are both "clean" and "cruelty-free" in the truest sense. I only share products that I personally use and that are made with the highest integrity. Keeping the contents of the products used for caring for your mouth and teeth clean is imperative since they are going directly into your mouth! Look for products that are free of fluoride, sodium laurel sulfates (SLS) and artificial ingredients. Silkeny Organic Virgin Coconut Oil is made from fresh sun kissed coconuts, harvested from the renowned Coconut Triangle in Sri Lanka where simple way of life still prevails with environmental pollution at its minimal. Photo source: www.silkeny.com. Every morning I follow the Ayurvedic tradition of tongue scraping with a copper tongue scraper, followed by oil pulling with cold-pressed organic coconut oil - I love Silkeny! This practice can help you detox from harmful bacteria and improves gum health. I have been oil pulling for over 3 years and it keeps my teeth white, plus I have not had cavities for a long time. To oil pull: swoosh a spoonful of coconut oil in your mouth for 20 minutes, make sure not to swallow. Spit in the garbage (the oil may clog your drains) and then rinse and brush your teeth as you normally would. The ingredients in your hair products matter when it comes to your locks. These products sit on your hair, absorb into your scalp, and likely transfer from your pillow to your face, neck and back (depending on the length of your hair) when you sleep. It's Easy Being Green Shampoo and Living in the Momint Conditioner from SUDSATORIUM fit the bill as 100% vegan and hand-made using fair-trade, organic and cruelty-free ingredients. I have been so impressed with SUDSATORIUM's shampoo and conditioners, and I've tried a lot of natural hair products over the years. It's Easy Being Green Shampoo from SUDSATORIUM is a reviving collection of cooling spearmint and healing tea tree for oily roots and stressed out scalps. Photo source: www.sudsatorium.com. Living in the Momint Conditioner puts out the flames of itchy red scalps with spearmint and gives a tingly burst of freshness that clears the way for tea tree to root out built up gunk. Photo source: www.sudsatorium.com. As the body’s largest organ, your skin takes on the task of getting rid of toxins, but it is also vital to be aware of what you put on it too. Be wary of the term "fragrance" which is a proprietary term. This means that cosmetic companies do not have to list the contents, so really anything can be in them. Pure essential oils are one of the best choices for scenting body products. Wally's Natural Organic Body Oil is the perfect blend of chickweed, calendula, aloe vera, vitamin E and other botanicals. Photo source: www.wallysnatural.com. Carina Organics Sweet Pea Hydrating Skin Cream is formulated with natural and certified organic plant, vegetable, flower and tree extracts. Photo source: www.carinaorganics.com. Look for products made with simple, organic ingredients, like Wally's Natural Organic Body Oil. I was introduced to Wally's at the Natural Products Expo West in Anaheim, CA this past March. I love the smell of this moisturizer. It contains zero mineral oils, instead it is a combination of sesame seed and essential oils, including lavender and geranium. It even comes in a convenient rollerball applicator and is nourishing for stretch marks, scars, dry itchy skin, skin irritation and helps fight the signs of aging. I have personally found it to be incredibly soothing for dry skin. Another favourite is Carina Organics Sweet Pea Hydrating Skin Cream. This vegan lotion is one of my top choices and it is incredibly luxurious, not greasy and super hydrating. It is also scented using essential oils. If you are looking to exfoliate and detoxify, dry brushing your skin is an easy, natural practice. It will help get your blood flowing and make your skin feel great. I have been dry brushing consistently for the last 6 years before bathing. You can read all about dry brushing in a featured article from Province Apothecary here. For products specifically formulated for your face the same rules apply - keep them simple and organic. I have really been enjoying Province Apothecary's line of skin care products lately. You can read all about this small-batch skin care line here. 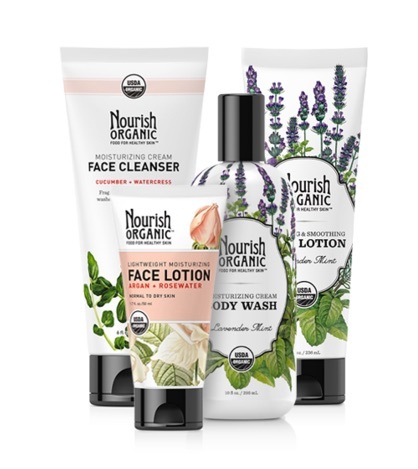 I also love Nourish Organic's healthy, concern-free, eco-friendly skin care products that really work and that are as pure and clean as the organic fruits and vegetables you find at your local market. Nourish Organic's healthy, concern-free, eco-friendly skin care products are as pure and clean as the organic fruits and vegetables you find at your local market. Photo source: www.nourishorganic.com. Schmidt's Cedarwood + Juniper Natural Deodarant provocative blend offers a warm, woody scent that is irresistible, with antiseptic and detoxifying benefits. Photo source: www.schmidtsdeodorant.com. I have tried many, many natural, aluminum-free deodorants and lately my go-to has been Schmidt's Natural Deodorant. The ingredients are vegan and clean. It is also effectively neutralizes odour and absorbs wetness. Using makeup with pure and organic ingredients is one of my tricks to keeping my completion clear and my skin clean. A long time favourite makeup brand is 100% Pure. Most of their fruit dyed makeup products are vegan (the only animal ingredient that they use is cruelty free honey) and they offer makeup brushes made with synthetic fibres. Instead of using mineral colorants for their cosmetics 100% Pure has created a process to extract pigments from fruits such as strawberries and peaches too! 100% Pure Fruit Pigmented Peppermint Candy Blush is one of my favourite beauty products. It even smells like peppermint! Photo source: www.100percentpure.com. Nail polishes are some of the most toxic beauty products on the market. I love Trust Fund Beauty Nail Polishes which are vegan and "10-Free" of toxic ingredients commonly found in nail polishes like formaldehyde, camphor, phthalate, toluene and formaldehyde resin either to name a few. These polishes are high quality and they offer a variety of gorgeous colours. Trust Fund Beauty Nail Polishes are vegan and "10-Free" of toxic ingredients commonly found in nail polishes. Photo source: www.trustfundbeauty.com. I hope that the information in this article has been helpful and insightful. Wishing you a wonderful Earth Day! Note: the products listed in this article are not paid promotions. I only share products that I personally use and that are made with the highest integrity. * Suzuki, David. "Canada's Cosmetic Regulations Could Use a Make-over. "David Suzuki Foundation. DavidSuzuki.org, n.d. Web. 22 Apr. 2016. ** "Facts and Sources." COWSPIRACY. N.p., n.d. Web. 22 Apr. 2016. <http://www.cowspiracy.com/facts/>. *** Silverstone, Alicia, and Victoria Pearson. The Kind Diet: A Simple Guide to Feeling Great, Losing Weight, and Saving the Planet. Emmaus, PA: Rodale, 2009. Print. **** Mandal, Ananya, Dr. "What Are Lymph Nodes?" News-Medical.net. N.p., 27 June 2012. Web. 22 Apr. 2016. ***** Group, Edward, DC, NP, DACBN, DCBCN, DABFM. "Why You Should Use Aluminum-Free Deodorant." Dr Groups Natural Health Organic Living Blog. N.p., 22 May 2015. Web. 22 Apr. 2016.